They along with one other woman were arrested by police this week. 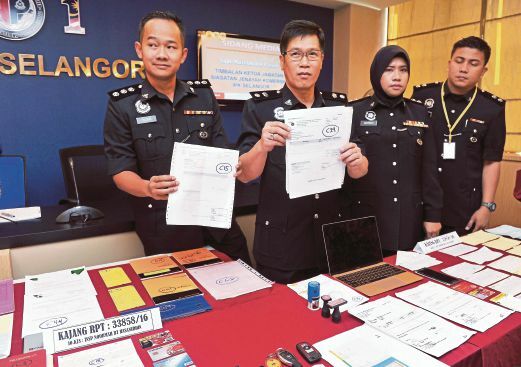 First, they arrested a 30-year-old businesswoman and her 31-year-old husband at the Suria Jelutong service apartments in Bukit Jelutong, Shah Alam. Then they nabbed a 47-year-old 'Datuk' in Puchong and along with a 30-year-old woman in Kajang. During the arrests, police also seized various documents, cheques, cheque books, four mobile phones, a Macbook, a Mercedes E250 and BMW 328GT from the suspects. However, she had other plans. She used the official contract letter to forge documents to make it look like the Defence Ministry gave her a multi-million ringgit project to supply digital camouflage uniforms. Using the forged documents, she along with her husband, lured over 1,000 people, from her village and civil servants, to "invest" in their dubious. They claimed that they did not have enough funds to fulfil the tender requirements. They promised them returns of between 30% and 90%. However, the "returns" turned out to be money invested by other people. Soon enough, as the couple's scheme grew, they started keeping the cash and the so-called "returns" stopped. The people, mainly from Terengganu and the Klang Valley, who were lured by the couple were in their 20s and 50s. Many even took loans from family and friends in order to invest. The minimum investment amount that one person had to give was RM10,000. The largest investment they received was RM900,000, made by an Aviation industry professional. Their scheme started in April 2015 and the couple raked in RM55 million. While many reports were lodged, police investigation revealed that they also fooled high-profile and prominent figures. However, none of them has lodged reports yet. “We seized a record book from the suspects listing their investors and amounts they had invested. There are high-profile names in there but none of them have lodged reports. Perhaps they are embarrassed,” Selangor Commercial Crime Investigation Department Deputy Chief Supt Mazelan Paijan was quoted as saying by The Mail Mail. She decided to take matters into her own hand and checked with the Defence Ministry. During her investigation, she found the documents the couple had shown to people were fake. She then lodged a police report about being cheated along with 40 others. Based on their investigation, the police say the suspects have eight additional luxury cars including a Porche, which are yet to be seized. They also have properties gained through illegal means. However, none of them was registered under their names. While the police are working to identify the whereabouts of the vehicles, and also to identify the properties that they bought, Mazelan stressed that those who are keeping the vehicles, or have the couple's properties registered under their own names, are urged to come forward. He said if they fail to do so, they can also be charged for abetting criminal activities and being in possession of stolen items. "Police are also looking for seven more suspects aged between 28 and 55," he said. Looks like the inability to master the English language isn't the only reason.